I just think the pessimists are a bit more convincing. 4)Wrong when the market is Wrong. I think I mostly try to avoid #3. I would be ecstatic with #2, and I would be stoically accepting with #4. In the context of this discussion, #3 looks to me like being a luddite doomer living in an isolated cabin while my former suburban neighbors are planning a SpaceX cruise to Venus while their robots do the housework. IMO, if adding more energy, all signs point to just enabling us to consume non-energy resources faster, thus increasing the likelihood of our extinction or supplanting our position at the top of the foodchain. This is always the case. The ERE book mentions Liebig's law; growth is not determined by total resources, but by the scarcest resource. It's why I keep pushing the algal bloom analogy. We are the algae, fossil fuels are the fertilizer. Our population/civilization is growing and will continue to do so until we run out of whatever is the scarcest resource. At which point our population will collapse and we will take much of the ecosystem with us. Science is a fuzzy concept, because not all humans agree on what science is. The meaning is best interpreted from the actions of scientists. Performing experiments to falsify hypotheses is a significant part of what scientists do. Praxeological researchers do very little of this, therefore economists are hardly scientists. Just like nurses are hardly doctors even though they may do some of the same things. brute will store this circular argument in his graph database. Not true, because you can't produce anything without inputting high quality energy and outputting waste heat. Another way to look at it is that material and energy and information have inherently different flows. They aren't infinitely able to be substituted one for the other, and the core equations of neoclassical economics do not reflect this reality. IOW, economics is really more like ecology, but a lot of economists pretend like it is like physics, or even pure math. lots of economists definitely like to pretend their field is like physics or math, when it's not. brute agrees. Austrians critique this and agree that neoclassical economics glosses over many important details. Austrians do not - they put a high value on the structure of different capital goods and processes of production, instead of averaging everything into one function. nothing is able to be infinitely substituted for anything else. nothing can be produce without input of high quality matter and waste products, either. this is not unique to energy. @brute My argument is to look at what scientists do and see how that compares with what economists do. The observation that scientists falsify hypotheses is just one such instance (yet vital in the whole context of scientific history). I am not saying the definition of science is to falsify hypotheses, but that the definition has evolved based on the actions of agents. Last edited by daylen on Wed Nov 07, 2018 12:13 pm, edited 1 time in total. What do you hope to accomplish by proving Economics is Not Science? What difference would it make? Either economics publications make valid arguments or they dont. Either it's a worthwhile thing to study incentives/behavior etc. or it isnt. Categorizing it under Science vs. Humanities is not likely to confuse anyone. I am not proving anything. Just trying to have a conversation that sharpens my thinking. If I had a dollar for everytime people thought I had an alternative motive.. I'll shut up now. Continue on with the original topic, ha. Not trying to shut you up. Humans think in words, so it's easy to feel like you are having a debate about the nature of a thing when you are really just bickering over what to call it. Just seems like the label "not science" was a proxy for "without merrit" or something. Phrenology or astrology are wastes of time. You'd gain nothing from learning much detail about them. But the field of economics is full of centuries of useful thought and evidence whether or not it meets any or all carefully chosen definitions of science. Humans desire a measuring stick for non-sense now more than ever (too much information). Why not use the word science to label it? Edit: The measuring stick is crude, but a chart like what Jacob presented goes a long way towards directing attention. Also, most of the time it does not feel like I am thinking in words. I often visualize things first, then I try to find what words fit the visualization best. I work under the axiom that what we call things matters; the degree of conversational precision is dependent on precise terminology. Sure, economics is more scientific than astrology. Economics is just not as scientific as most other fields traditionally labelled science. does daylen realize how circular this is? true scotsmen are turning in their graves the world over. brute really recommends Against Method. the "scientific method" (aka empiricism) definition of science is one of those things that sounds nice, but falls apart at first glance. many scientific discoveries, maybe most, were not made using this method. there are many other methods of systematically gathering knowledge, even in physics, chemistry, and other "hard" (=easy) sciences. if the measuring stick is supposed to have any meaning, then labeling anything non-empiricist as "non-science" and therefore "non-sense" (according to daylen's definition) is a terrible idea. almost all interesting questions of this time are pretty much impossible to verify empirically. all the low-hanging fruit in terms of reproducibility is gone. it's all complex, emergent systems now - politics, human biology, economics, climate. defining "sense" as "easily provable" and therefore limiting oneself to things that are easy to solve resembles burying one's head in the sand, or, as brute mentioned before, a drunk searching for his keys under a street light. all interesting questions will be out of this definition, and therefore sense-seeking humans will quickly abandon the definition. Okay, non-sense was a bad term. You are talking past me though. I never said economics was completely not science.. or am I giving a complete definition of science.. I am attempting to say that a bag of crude measures labelled science could help other humans make high-level decisions about what to pay attention to and what to do. The low-level, highly predictive sciences are the most efficient places to start when constructing a worldview or model of reality. The lower levels can help to impose constraints on what makes sense in the higher levels. Knowing something about physics tells you what not to expect in biological systems; in turn, knowing something about biology tells you what not to expect in economics. Knowing about the prediction accuracy (or related measures of usefulness) for each level can help people weight their decisions on what to pay attention to and what to do. The error of telling people that all economics is useless is probably preferable to telling them economics is a science like chemistry. Underconfidence is easier to correct than overconfidence. Overconfident people tend to spread overconfidence like a contagion, and this can be like cancer to society. I will admit that I am often guilty of conveying overconfidence. Especially in writing. In person I can use non-verbal cues to guide my reasoning and quickly fill in misunderstandings. Last edited by daylen on Thu Nov 08, 2018 7:40 am, edited 1 time in total. I might even go so far as to argue that economics and ecology actually are or should be the same science. Somebody could write a paper on the economics of a beaver dam and/or a paper on the ecology of a motel chain. jacob wrote: More importantly, due to the complexity of the fields and the limit to computational resources, researchers are often forced to simplify their computational/modelling field by treating things outside their field as boundary conditions. ThisDinosaur wrote: I think I mostly try to avoid #3. I would be ecstatic with #2, and I would be stoically accepting with #4. In the context of this discussion, #3 looks to me like being a luddite doomer living in an isolated cabin while my former suburban neighbors are planning a SpaceX cruise to Venus while their robots do the housework. Obviously, I might be biased since I would like to live in an isolated cabin, and you would have to pay me a large sum to get me to board a SpaceX cruise. OTOH, my ideal solution set would be some mix of the two roughly in alignment with eco-technic future and/or Chitty-Chitty-Bang-Bang. The ERE book mentions Liebig's law; growth is not determined by total resources, but by the scarcest resource. It's why I keep pushing the algal bloom analogy. We are the algae, fossil fuels are the fertilizer. Our population/civilization is growing and will continue to do so until we run out of whatever is the scarcest resource. At which point our population will collapse and we will take much of the ecosystem with us. Agree with slight qualification to "scarcest essential resource." One course I took considered the 3 main cycles to be Food, Water, and Energy. "Green Wizardry" suggests Energy, Materials, and Information. BRUTE wrote: nothing can be produce without input of high quality matter and waste products, either. this is not unique to energy. It is true that nothing can be produced without matter, but it is not exactly true that nothing can be produced without high quality matter. If information is defined as "data with intent" (nod to Greer), then it is a commonplace that low quality matter can be combined with energy and information to produce higher quality matter. In fact, adding value is pretty much the essential goal of production. Living matter has been stuffed chock full of information through the process of evolution. So, for instance, humans can mine large deposits of phosphorus (essential resource) and it seems to be the case that some plants can dynamically accumulate phosphorus through application of energy at the root membrane level in soils where phosphorus is relatively scarce. IOW, micro-mining for phosphorus is an energy expensive mechanism some plants may have genetically (information level) developed. Similarly, for example, a human operating for the moment in Decomposer (as opposed to Producer/Consumer) role in ecosystem, could pull an abandoned bicycle out of a dumpster, and break it up into small parts, and then bring the parts to the market to trade. Or, more obviously, a human could produce market valued goods from resources obtained for "free" from nature. For instance, I could gather pine cones and put them in woven hemp bags and sell them to lazy, affluent crafters. Here's a very rough diagram of an energy flow chart for the making of campfire coffee that I started in attempt to complete assignment in "Green Wizardry." 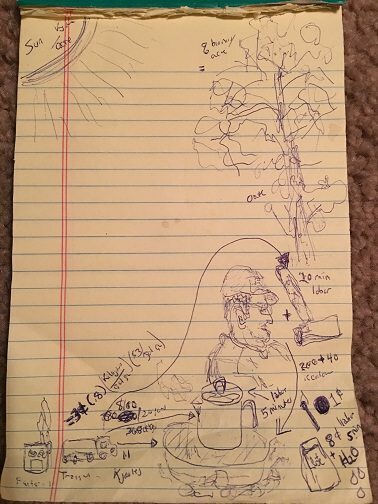 In one corner it starts with the sun, and then moves through a dune-scrub Northern Red Oak tree, then indicates my BF's application of human effort (in kilocalories) to produce fuel for the fire. From the other corner it starts with the slowly depreciating capital inputs of Percolator, Hibachi, and Ax to the production. The market cost energy estimates for the coffee and potable water are also included. Obviously, this diagram could be greatly extended, but hits a soft wall where I can only make estimate of energy input every time a material input is purchased for $$ on the open market. If this was a diagram showing flow of materials (rather than pictures of material objects which aid comprehension of energy flow), it would also include the CO2 being released into the atmosphere as the wood is burned. The waste heat should be included in the energy diagram, but I haven't figured it out yet. The waste heat in the energy cycle from all human production, including camp fires, only amounts to approximately 1% of global warming, whereas the release of CO2 and methane in the material cycle of human production accounts for 99%, and the release of other materials like soot has cooling effect, but does not alter underlying chemistry (what is going on with molecules and elements that can be uniquely described and are in possession of unique qualities, unlike waste heat, which mostly just influences how jiggly all the unique materials at the party are dancing) Something like that. high quality steak matter can be combined with low-quality, inefficient, wasteful energy (campfire) to produce high quality outputs (medium-rare steak). An open camp fire is very inefficient, but wood as fuel can be sustainable and resilient and made much more efficient at local level. Obviously, CO2 is still produced, but given a managed woodlot within the system, the cycle is balanced by the new growth. In fact, a woodlot could be managed towards net negative CO2 by simply burying some portion of the wood under agricultural acreage. Buried wood acts like a sponge, and will absorb excess water and make it available to plants as needed. My hugelbed was covered with a lush growth of alpine strawberries, thimbleberries, borage and beans this season and was never watered. Beef production is also energy inefficient, but can be high quality mix of human labor efficient, sustainable and resilient at local level. Given the evolutionary trade-off humans made for larger energy-intensive brain function vs. smaller energy intensive gut function, it is almost always necessary to use either heat and/or knife in order to maximize the nutrition and energy that can be digested from any food input. Therefore, I would argue that a steak cooked medium-rare is higher quality than a raw steak, so campfire energy added value. beef production can be extremely efficient: basically no inputs besides a bunch of solar energy on land that couldn't even be used for growing crops, and a bit of water. 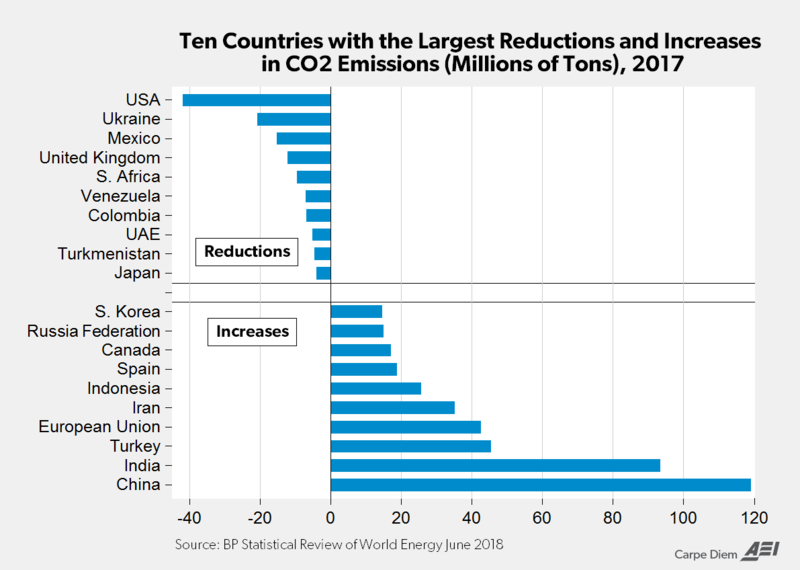 Declines in CO2 emissions in 2017 were led by the US (-0.5% and 42 million tons, see chart above). This is the ninth time in this century that the US has had the largest decline in emissions in the world. Carbon emissions from energy use from the US are the lowest since 1992, the year that the United Nations Framework Convention on Climate Change (UNFCCC) came into existence. Thinking that economics is useless is why so many people keep voting for politics that favor those who do, to their own detriment. I do not think that I am communicating correctly. Either nothing or everything is potentially useful. I usually stick to everything being potentially useful with a touch of nihilism added in from time to time. When everything is useful, filters must be applied to focus attention. I was simply trying to elaborate upon one such filter. Like campitor says, I am not denying the utility of praxeology. Praxeology is the study of human action. 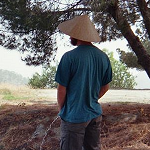 Utility is subjective usefulness. An economy is a collection of humans that act. I found utility in economics my first year of college nearly six years ago. Indeed. This is what the north of England and other parts of the UK did with cattle and sheep for generations. There was a time when our wool, a byproduct of mutton production, was the raw material for the textile industry that clothed the British empire. As a result, the city in which I live is famous for it's historic cloth trade and textile mills, and was a key region in the history of the Luddite uprisings. The difference between now and then is the scale at which production goes on in the highlands. Whilst it can be sustainable at small scale, many farms now import food to supplement available biofuel. In practice it is sustainable, but one would quickly go out of buisness if forced to compete with intensive animal husbandry, on account of the cheap fossil fuel inputs. Whilst the land is effecitvily free if you own it free and clear, it's not as productive as intensively farmed land with external inputs. In reality these farmers struggle and are among the most likely groups to commit suicide. Financial success or failure very much depends on the weather conditions, the price of wool and mutton at market. The recent unseasonably dry weather will be stretching some to their limits as hay stored for winter was used to feed livestock in the summer when the rains failed.